Excelta offers a variety of optics which include Eye Lopues, Magnifiers, and Inspection Mirrors. The Excelta Super Optivisor has a magnifying power of 2.2x and can be used for precise viewing with the added 3.3x power lens. Excelta's superior clear-view lens does not have a center post to increase operator viewing. The shatter-resistant precision optical lens brings the smallest detail up to a larger and sharper image. This unit comes with an adjustable headband that can be worn over regular glasses for ease of use. 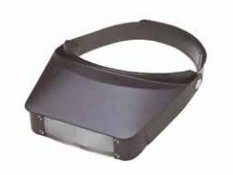 Illuminated Optical Magnifier 5x and 10x power hand held magnifiers have a lens dimension of 1 1⁄4 inch square. Perfect for quality control, inspection personnel, and comes with an unbreakable plastic case for protection. Used for magnification in assembly and inspection. The two element optical glass construction that brightens and sharpens the focus for optimum clarity. The loupes possess a 360° clear acrylic base to admit light from all directions for a most vast range view and Excelta's five Star quality rating. Thanks for sharing this great post. As we are also working with inspection mirror.